Regardless of whether you live in an area that is prone to flooding or not, there is always a chance that you could experience water damage from a flood in your own home. After all, unexpected heavy rainfalls are often enough to overwhelm any community drain system, and if your home is not prepared, there is a good chance that some of the flood waters will end up seeping through or backing up through a drain. This is especially true for home owners who have basements. If you have recently been the victim of flooding at your home, regardless of how major or minor the damage, there are some steps that you should take to recover your home. Replacing furniture and other items can be expensive, so try to get everything important out of the basement. Getting it out of there may help save the furniture. Put it outside to dry or set a fan on it. If the restoration of the basement is going to take a while it may be worth getting a storage unit to keep the furniture in. First of all, you will want to get all the water out as fast as possible. This remains true regardless of whether you have one inch of water in your home or an entire foot; leaving water to sit can not only lead to unhealthy bacteria growth and further damage your belongings, but it can also lead to mold growth and even foundation damage. All of these, even with home owner’s insurance, can be very expensive to repair. 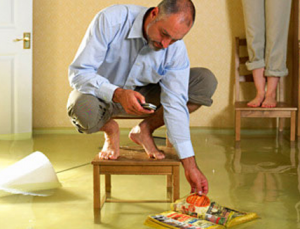 Once you have the flood water pumped out, it is a good idea to call in an inspector soon after as a way of checking your home for flood damage. This includes making sure that there is no mold growth, foundation damage, or anything else that could pose a threat to you and your loved ones residing in the home. If there is any damage, then the same company that did the inspection will more than likely be able to perform the repairs as well. These may even be covered under your home insurance policy, though you will want to check with your insurance agent to be sure. Finally, it is a good idea to call out a plumber to your home so that you can have necessary work done to prevent flooding from occurring at your home again in the future. This may involve lying new piping and working on your drain to keep it from backing up and flooding your home. There are all kinds of preventative measures that a quality plumber can perform at your home to keep this kind of damage from happening to you and your home again the next time heavy rain or severe flooding hits your area. Author Bio: Mike is a freelance blogger that used water heater replacement Shreveport when his basement flooded. He usually writes about home issues.